The adductor group, or more commonly known as the “groin”, is located on the inside of the upper thigh and consists of 5 muscles: pectineus, adductor longus, adductor brevis, adductor magnus, and gracilis. The main function of this group of muscles is to bring your leg closer to the midline of your body or cross one leg in front of the other. If that isn’t cutting it for you, think “Thigh Master”! The Thigh Master works the adductor group and helps tone the medial (inside) thigh. These five muscles originate on the pubic bone and insert on the femur (thigh bone). These points of connection dictate the movements these muscles perform. 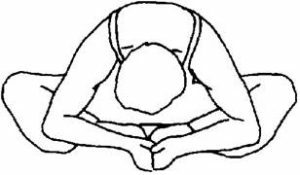 Shortening of these muscles, or concentric contraction, bring the femur closer to the pubic bone thus creating the movement of adduction. The most common injury to this group is a muscle strain, also known as a groin pull. Symptoms of a groin pull include stabbing pain in the groin area that may or may not radiate down the inside of the thigh, swelling and/or bruising, muscle spasms, and the inability to adduct the leg. There are three different grades of muscle strain in the groin. Grade 1: Minor tearing of muscle fibers with mild discomfort and mild to no pain while walking. Grade 2: Moderate (more than 50%) tearing of muscle fibers with swelling, bruising and moderate to severe pain with difficulty walking. 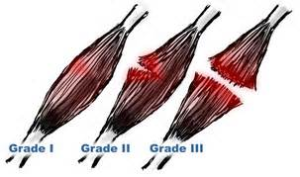 Grade 3: Almost complete to complete rupture of the muscle fibers and tendon with severe pain and inability to walk. While the belly of the muscle can be injured, the musculotendinous junction between the belly and the tendon is thought to be the most commonly injured area of the muscle. This can cause problems with healing because that area of the muscle has less blood supply than the belly so it does not get the nutrients needed to properly heal. How does one injure their groin? There are several different mechanisms of injury for a groin pull including sprinting, quickly changing directions, overstretching the muscle, jumping or landing after a jump, running uphill and rapid movements against resistance (kicking a ball). Sports such as ice hockey, soccer, football, basketball, rugby, martial arts, gymnastics, dance, and track and field tend to have higher incidence of groin injuries. In fact, about 2.5% of all karate injuries are groin related and between 10-18% of all soccer injuries are to the groin. There are also factors that can increase the risk of an athlete pulling their groin. Those include not warming up properly, preexisting weakness in the adductor group, previous injury to the area, tightness in the adductor group, biomechanical factors and lower back problems. 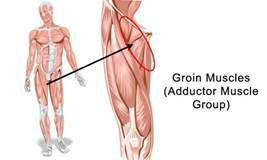 Treatment of a groin injury can be tricky depending on the area of the muscle that is affected. Injuries to the muscle belly, for example, are best managed with light stretching, a protocol of strengthening exercises and pretty quick return to activities. Injuries to the musculotendinous junction, however, require a more conservative approach to treatment, including rest until the athlete is pain free, mild stretching and strengthening over several weeks, working their way up to running and sprinting then finally running and sprinting with quick directional changes.